What is the best RV washer dryer combo? There are many products in this category on the market making it hard to determine the right one for your recreational vehicle. It is why you need to compare your options based on several factors including capacity, drum, controls and other features. For this reason, we’ve put up a guide that will help you pick a washing machine that suits your load capacity requirements and features you’re looking for. In this guide, we’ve also reviewed the top picks for your reference and comparison. If you’re ready, let’s start and help you select the best washer and dryer combo in the following. Just as you can read from Splendide washer dryer combo reviews, the WD2100XC is a great choice for many users noting that it makes their lives easier for its superb features and functions. The combo dryer and washer is one of the most reliable in its class because of its max performance that outdid many of the same products on the market now. One thing I liked about the Splendide White Vented model is that it operates silently. You won’t even notice it is working. I would also like to recommend this model for its brushless AC motor that proves suitable for all types of recreational vehicle, travel trailer and campers. I would also like to note that the Splendide does not just offer quiet operation but also space saving. 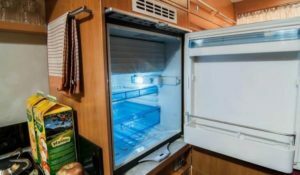 As you may already know, space is a premium in our RV because the washer is not the only appliance we have onboard. This one has compact size of 33-1/8″ x 23-1/2″ x 22-5/8″ (Height, width, depth). It is ideal even for small RVs, and it is something you will appreciate about this model. 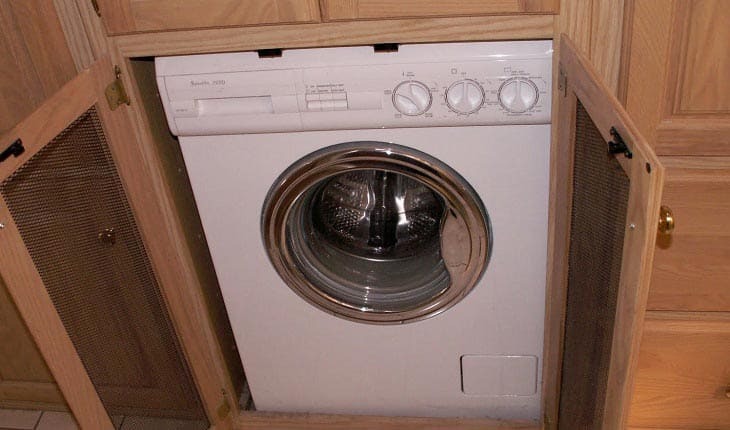 It is also very easy to use and operate just like using a traditional washer in our homes. You can choose your settings and wait for your laundry to be done. It is so convenient to use that you only have to select the wash cycle and then set the drying time before pressing the start button. One more thing I liked about the Splendide WD2100XC is its wide opening door, giving users an easy time to load the dirty laundry. With it, you and your loved ones will find camping more worthwhile because washing clothes has never been this easier aboard a recreational vehicle. This model also has soft touch knobs that turn easily. When it comes to the cycle status, you will easily find it in the always-updated display. In addition, the laundry aids can be added automatically, while the washer’s water level can easily be adjusted, adding ease of operation. When it comes to the washing efficiency, you will love that this powerful washer and dryer combo offers 1200-RPM spin, something useful for heavy cottons, which can also dry up to 20 percent faster than other washers on the market can. On the downside, this combo washer and dryer is a bit costly. If you’re looking for Splendide stackable washer and dryer, you should not miss out the Westland WDC7100XC, which is one of the most reliable choices around for its supreme power spin that reaches 1200 RPM, cleaning clothes more efficiently. It also works best when it comes to drying even heavy cottons, drying them up to 20% faster. The washer and dryer combo is an advanced machine that is the perfect companion for every recreational vehicle. One thing I liked about this is its compact size that won’t take up much space in your vehicle. While it is compact in size, it is a powerful machine that also works quietly. I also appreciate that the dryer and washer combo because it is suitable for the mobile environment of motorhomes. In addition, it is versatile that it can also be used in condominiums, apartments and small homes. You will also appreciate that it is designed with a stability regulator, allowing it to work quietly once it started operating. And even if it is compact in size, it is able to handle 10 wash cycles, giving you full control of choosing the cleaning cycle. I also liked that it is easy to operate for its controls, which can help you eliminate any mistake in operating it once you started using it. The Splendide 2100XC washer dryer combo is also an ideal washer that has an automatic load sense that saves you in water consumption especially useful when you’re not washing many clothes. You will also appreciate that it has different settings, including 10 wash cycles, a dry time selector, 3 dry cycles and 11 lbs dry capacity. When it comes to washing capacity, this model is very efficient that it can accommodate up to 15 lbs. The energy saving washer also makes loading easy because of its wide door opening. You will also be able to improve wash and dry results and prevent wrinkling for its bi-directional drum rotation. 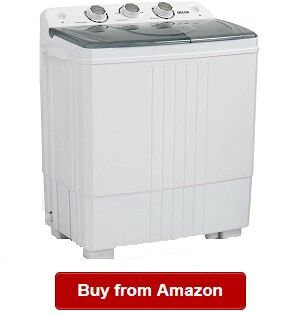 I would also like to recommend this model because it has multiple wash cycles, letting users choose based on their preference and the type of clothes you’re washing. On a negative note, the dryer does not dry clothes quickly. Just like other models, such as the Splendide 7100xc, from the brand, Splendide ARWXF129W is one of the best options if you’re looking for a tough and reliable washer and dryer combo. It is suitable for mobile environments because it is specifically designed and built for the recreational vehicle, camper and travel trailer. It has the solid and compact features that you will appreciate from a small yet powerful combo washer and dryer for your camper or travel trailer. The washer offers up to 13 wash cycles, allowing you to select based on your needs and preferences, making washing and drying your clothes easier and faster. But that’s not all because the washer and dryer combo also comes with four special wash options, giving you the freedom to choose the right cycle for your needs. Another thing I love about the SPLENDIDE ARWXF129W is that it is specially designed to deal with constant movements in a recreational vehicle. This model is built to survive the road for its components, such as shock absorbers and heavy-duty springs. And as a part of its durable components are the reinforced cases and stainless steel drums, ensuring it can keep up with the RV environment and long-lasting use. Another important feature of the all in one washer dryer combo is its self-cleaning pump, adding to the ease of operation. You will also appreciate its built-in self-diagnostics, adding to its advanced features. When it comes to alerting you of the wash cycle, it is built with a digital time remaining display, making it one of the most advanced on the market for the innovative design and built it has. The model also has this instant unlock door latch, which makes it easier to operate as well. It is also an efficient washer that ensures proper cleaning of your clothes regardless of soil degree or fabric type. Overall, the SPLENDIDE ARWXF129W is one of the most impressive washer and dryer combos to date. It is much suitable for the RV environment and offers supreme washing power, making our lives easier when washing even a heavy clothes’ load. However, this model tends to vibrate when washing a heavy load. When shopping around for a best RV stackable washer dryer, you might want to include the Portable Washing Machine TG23 for its superb function and top performance. It is one of the most innovative washer and dryer combo around that is both durable and strong suitable for mobile environments, such as in travel trailers, campers and motorhomes. The ThinkGizmos washing machine has a cool and simple design, with a washing machine and spin dryer, yet it is compact to fit small RV spaces. I also liked that the model already comes with two tubs, but it does not consume much space. It is for the same reason that the TG23 is also ideal for condominiums, apartments, cabins and other small homes. This model is also perfect for travel trailers, campers, yachts and mobile homes. You also have the option of setting the washing machine for a soft or a normal wash for up to 15 minutes ensuring clothes are thoroughly cleaned and ready for use again after spinning them for up to five minutes. It is one of the easiest to operate, giving you convenience and letting you enjoy your camping even more. This washing machine also has a capacity of two kilograms per spin cycle and 3.6 kilograms per wash cycle. It is ideal for small loads in the recreational vehicle. I am also impressed with the lightweight and compact design of the combo washer and dryer that makes it great for limited spaces, such as in a caravan or for camping. You also don’t need plumbing before you could use it. Instead, it only needs water access with a drain area. In addition, I liked that the washer and dryer combo is simple to operate. You only have to add water, detergent and clothes before setting it to your preferred wash cycle. When washing is done, you can put them in the spin dryer so that they can dry and ready for use again. I also recommend the best washer and dryer for RV because it includes all the things you need to make it work, including a fully translated manual and water fill hose. So right out of the box, you can use it instantly and without any hassles. 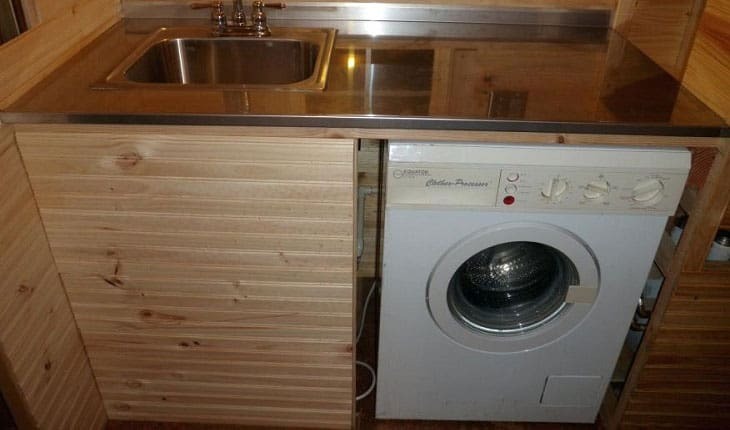 On a downside, this washing machine has a small wash and spin capacity. The portable DELLA washing machine washer and dryer combo is a great addition to your recreational vehicle because it can make your life easier. With it, you will be able to do the laundry without any hassles but with ease because it is ideally designed and built for the tough and mobile RV environments. It is made of solid and durable components that make it an ideal choice for mobile homes, yachts, campers and travel trailers. The DELLA machine can deal with constant shocks and vibrations in the recreational vehicle and camper. Having that said, you can be certain that it will last long without much maintenance required. It is tough and built for mobile homes, while also offering silent operation. The machine offers an 11lb capacity, which makes it suitable for washing smaller loads of clothes. So whenever you’re camping and in a remote area, you can be certain that you will always have clean clothes to wear. 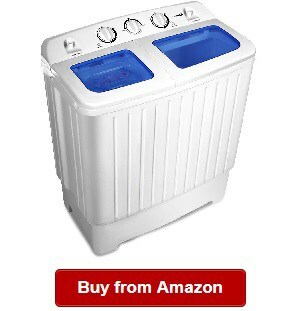 As you may also know, clothes can be soiled easily and heavily when camping, but you don’t have to worry about that with this small and powerful washing machine. You can be sure that your clothes will be washed thoroughly for its powerful and fast washing action. The Della compact washing machine is also suitable for light to medium loads, while also allowing you to choose the wash and dry spin settings based on your needs. The washer and dryer combo also has a drainage tube, which lets you drain water without any hassles and quickly. Using the Della portable machine, you can always save water and electricity. 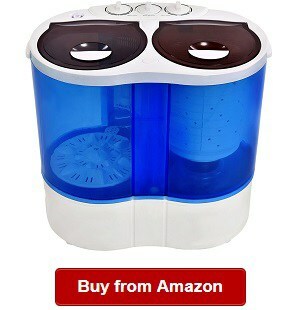 The product also offers ease of operation because you just have to put your dirty clothes, add detergent, fill with water, adjust the timer and then press to start the washing. Another thing I liked about the RV washer and dryer is that it has a timer control, one of its advanced functions adding to ease of operation. You can select for up to 15min for wash cycle and 5min for spin cycle. 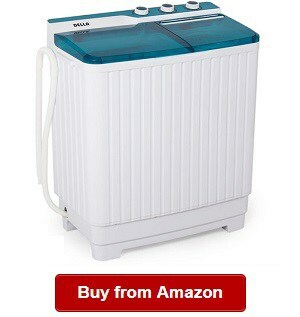 You will also like that it allows both the wash and dry functions at the same time, adding to its convenience of use. On a little negative, the washer and dryer combo has a small load capacity. It is not also a fully automatic washer. When it comes to solid and portable washing machines for the RV, you might want to take a look at the 17.6lbs capacity washer and spin dryer from a known brand that is committed to provide the best washing machines for the camper, travel trailer, recreational vehicle and mobile homes. It is a mini and compact twin-tub design washing machine that is ideal for small spaces, also including apartments and dorms. This is an easy to operate and time saving machine that lets you wash the laundry in less the time. Using it, you don’t have to wash by hand or take clothes to a laundry mat. 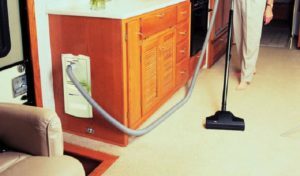 It is one of the most impressive models on the market now because of its solid and useful features and functions that give RV owners the convenience of using a portable washing machine that using a large washing tube with a washing capacity reaching up to 11 lbs. When it comes to the spin dry capacity, this model can handle up to 6.6 lbs of clothing. The washing machine is yours if you want relief from hand washing and be able to spend more time with your family when camping. You can set the washing cycle for up to 15 minutes or five minutes for the spin dry cycle. With it, you will have more freedom to select the time on which you want to wash your clothes with the intelligent settings of the combo washer and dryer. I also liked the space saving design of the washer and dryer combo when it comes to handling delicate and small loads. I noticed that you can also use this for delicate clothing, such as undergarments and shirts. The model has a powerful motor, 300W (washing) and 110W (spinning). I also would like to recommend the washing machine for its space saving design, which fits small spaces in the recreational vehicle. 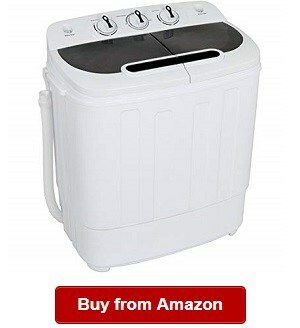 Plus, the combo washer is yours if you’re also looking to use it at home. Overall, the Giantex Twin Tub is what you need if you want relief from hand washing and spending too much time on it. With this machine, you can have more freedom, save more time and spend less effort when doing the laundry. On the negative side, you might have to spin dry twice if you’re planning to use the full capacity wash. Plastic body might break over time. The Super Deal twin tub washing machine is one of the most impressive models I found in the category of washer and dryer combo for the recreational vehicle for many reasons. For one, it is an effective washing machine that lets you conveniently wash clothes while enjoying your time with family when camping. You just have to put your clothes, add detergent and fill with water before setting the time and pushing the start button. With the portable machine that you can also use at home, you can enjoy clean and fragrant clothes all the time. When laundry is done, you can just drain water out of it using the drainage tube that can easily drain out the dirty water. When shopping around for a vented washer dryer combo, you should consider the Super Deal portable washer and dryer because it is also space and time saving. It works with up to 15min of wash cycle, allowing you to choose the settings based on your needs and preferences. In addition, it features up to five minutes of spin-drying time that lets you dry clothes so that they would be ready for next use. I also believe that it can be used with ease in small homes, such as cabins, apartments and dormitories. This model is one of those that I would like to recommend if you’re looking to use a portable and space saving washing machine that you can use in many places other than the RV. The washing machine also has a twin tub design, allowing you to use the two functions at the same time. With that said, you can wash and spin dry simultaneously. In addition, it allows moving clothes from the washer to the spinner whenever you need it. I also liked the powerful performance of this machine, featuring rotation per minute reaching up to 1300. The motor of the washer and dryer combo also has a maximum frequency 60 Hz. And not to forget, the combo also features a water efficient design and a wash timer. When it comes to capacity, it offers five pounds for its spin cycle and eight pounds for its wash cycle. On a few drawbacks, its plastic body might break over time, and it does not dry clothes quickly. Instead of buying an used RV washer dryer, you might want to consider a brand new portable RV washing machine that can last longer and require less maintenance. It is also a versatile pick that can be used in apartments, condominiums, yachts, travel trailers and mobile homes. Students can also use it in dormitories so that they don’t have to take dirty clothes to the laundry mat. Versatility is one of those things that make the portable washer and dryer a top choice for many recreational vehicle owners. Regarding its capacity, I liked that it can offer us with up to 10 pounds washing capacity, a larger one versus other washing machines featured here. In addition, the spin-drying capacity is also good at 5.5 lbs, but it is lower than those others reviewed today are. Even so, the combo washer and dryer is still a top rated choice because of its great performance. I also noticed that the combo washer is perfect for washing even delicate clothes, including undergarments and baby clothes. It is also a moveable model that you can use at home whenever you need it. The washing machine also has a durable and compact design that you can easily put in your RV, dorm or apartment. 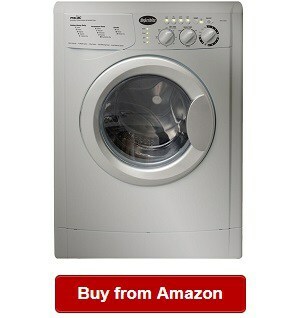 Regarding convenience, I appreciate that its powerful performance makes washing and drying clothes easier and faster. You can select the wash cycle time for up to 15 minutes, while five minutes for the spinning time. Also, this machine can offer you with a great rotation per minute reaching up to 1300 RPM aside from its powerful motor. You can also save so much time in doing the laundry because you don’t need to hand wash and feel the hassle of performing the manual work. 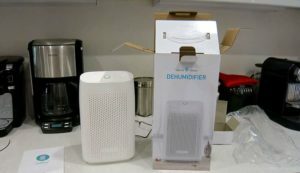 Then, you might be asking about its performance in quick and easy cleaning, and that’s something good about the KUPPET Portable Washing Machine. This twin tub and compact machine is easy to operate while also ensures thorough cleaning and fragrant clothes. When done with the laundry, you can simply drain out dirty water using the drainage tube that lets you finish the task in no time. With it, you can also save water and time. On a drawback, this model is bulkier than other products in the same category are. Portability, ease of use and powerful performance are also some of the things that make the Giantex 15lbs washing machine one of the top choices when it comes to shopping around for a washer and dryer combo. When camping, it is unavoidable to get clothes heavily soiled and sometimes stained. It is for these reasons that you need a washing machine that can deliver superb performance. One of those mobile home washing machine combos I found that suits the tough needs in RV includes this large capacity Giantex. Another thing that makes it a top rated product in the category is its versatility to be used for homes, yachts, travel trailers, mobile homes and campers. It has a solid and compact design that makes it ideal for use in small and tight spaces. 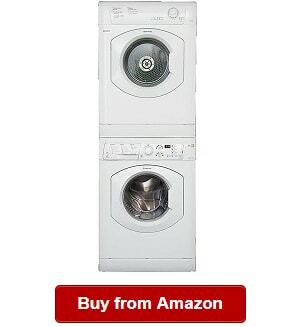 Using the Giantex, you can’t just rely on top performance but also on space saving design of this washing machine. One of the things I would also like to note about this model is its practical and economical purpose. For one, the portable washing machine can accommodate up to eight pounds of dirty clothes. And when done with them, we can simply spin dry for up to 6.6 pounds. So in addition to the top performance of the washer and dryer combo, you don’t have to worry about anything because it can accommodate small to medium washing needs. I also liked that it offers a low water operation aside from being energy efficient. These are only some of the top features of the machine that make it a top rated washing machine for many RV owners. With it, they can also save time and resources because it is water saving aside from saving you from the hassle of hand washing. On a drawback, this model is pricier than other models on the market are. But with its superb features and functions, it is definitely a decent choice for its performance and smart functions. Another impressive product that I should not miss on the list is the Dometic WDCVLW, a ventless washer and dryer combo, which offers supreme reliability and performance. 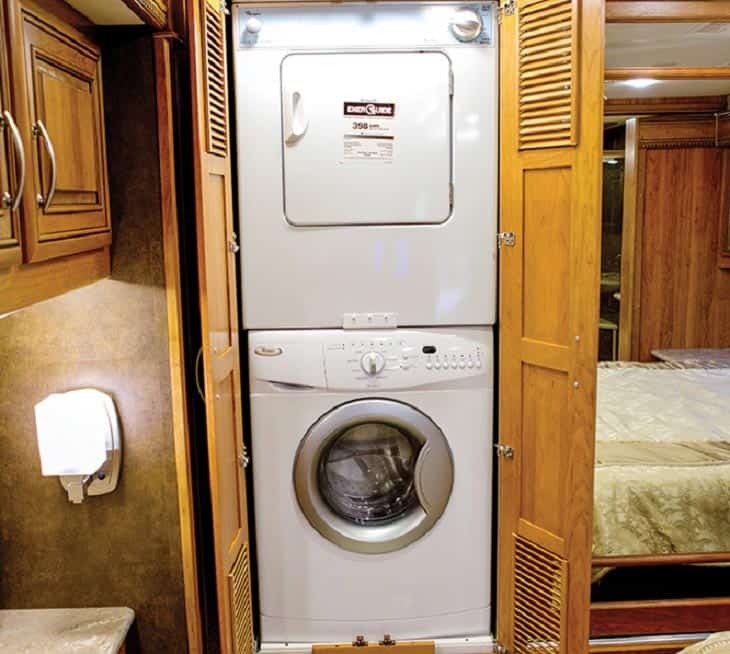 The Dometic ventless washer/dryer offers RV owners and their loved ones the convenience of not having to wash clothes manually, saving them energy and time. And once the washing is done, they can just transfer the clothes to the spin dryer so that they can readily use fragrant and clean clothes. One more thing I would like to note is the combo washing machine is also perfect for sensitive garments, including baby clothes and undergarments. 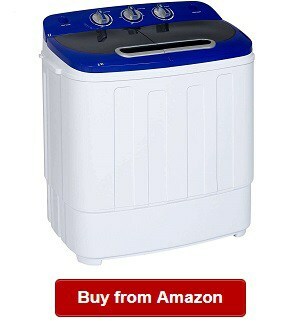 I also love the capacity of this combo, offering washing and drying a 15-pound load. With the Dometic WDCVLW, you can also experience the convenience of not having to wash your clothes by hand. 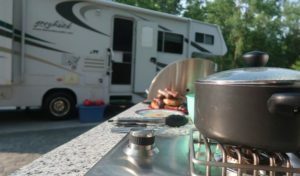 Using it, you can save much time and effort, allowing you to enjoy RVing with your family other than spending too long in washing the dirty laundry. The Dometic Ventless Washer Dryer also eliminates forgetting about transferring your clothes through its continuous cycle wash and dry. You can also rely on the machine that can drain water to your shower, sink or gray water tank. This machine also features a cooler door, making it safe for your pets and children. I also love that it has different cycle options, allowing you to choose one that is based on your needs and preferences. In addition, this model has an LCD cycle timer display plus an alarm, keeping you updated of the cycle status. It is also easy to use because of the bright display that also makes data easy to read. This model also features three compartments for the detergent, pre-detergent and fabric softener. It also includes a pump and a self-cleaning wash cycle. Another thing I would like to note is that the machine can use up to 20 percent of water versus the competitors do. I would also like to note that this is a more efficient model for its ventless condensing drying system that you cannot find from other products in the same category. On a little drawback, it features a lower RPM of only 1200. However, with its top features and performance, it is still makes for one of the decent choices on the market when it comes to shopping around for an RV washer and dryer combo. Best Choice Products is one of the most known brands when it comes to recreational vehicle washing machine and dryer combo because they manufacture especially designed and built washing machines, not only for the RV but also for dorms, apartments and camping. So if you’re shopping around for a durable and efficient washer that does not only offer an easy RV washer dryer installation but also ease of operation and convenience. You can also rely on the model that can handle up to 13lbs of clothes. It is the perfect companion for recreational vehicles because it is portable and compact, which can also help save water. But then, you don’t just save water but also time because it can handle up to 15 minutes per wash while five minutes per spin cycle. 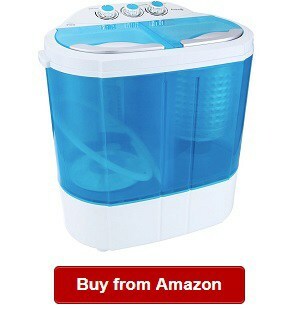 I would also like to recommend this product because of its capacity to handle up to 13lbs (five pounds for spin cycle, eight pounds for wash cycle). It is one of the most impressive washer and dryer combos around because it does give us the benefit of a shorter laundry time when it comes to smaller loads. In terms of versatility, I also find it useful that it is compact to fit premium spaces not only in the recreational vehicle but also for small homes, cabins, apartments and condominiums. So if you’re living in a small home without an access to a laundry machine, the Best Choice Products washer might be the one you’re looking for. The Best Choice Products Portable is not just powerful but also runs quietly even if it has a stronger RPM of 1300 versus other washing machines on the market do. With it, you don’t have to worry about noisy operations, while also keeping its powerful function to ensure clothes are thoroughly washed. It is also one of the most compact around for its dimensions of only 23” x 13.5″x 26” (LWH). The combo is also one of the lightest around for its 24 lbs weight. It gives fuel saving because it does not add too much weight in your vehicle. Overall, the portable washing machine is one of the most impressive around for its superb cleaning performance that is ideal for heavy demands in the RV. It is a well-designed and built machine that is lightweight and easy to store. The machine has a sufficient capacity in handling your washing needs. On a little negative note, the washer and dryer combo has a lower load capacity versus other models on the market do. We should not forget about the DELLA Compact Twin Tub Washer and Dryer Cycle in today’s top picks of RV washer and dryer combos for its solid features and superb performance. So aside from reading and comparing Splendide washer dryer reviews, you should also not miss looking into the Della twin tub RV washing machine that also comes with a built-in pump. Another thing I would like to note about the Della washing machine is its portability. You can easily move and transfer the machine from one place to another. In fact, you can also use it at home whenever you want. This combo washer and dryer also feature a large capacity, reaching up to 19.8 pounds, ideal for light to medium laundry loads. In addition, I love that the model is also ideal for mobile environments because it can deal with shocks and vibrations. Also, you can rely on this model for easy monitoring of the cycle status because it is designed and built with lid that shows you the water condition and wash and dry cycle condition. I would also like to recommend the twin tub machine for its ability of washing and drying all types of clothing. You can load delicate garments, including towels, printed shirts, socks and undergarments on it without any problem. You will also love t hat it comes with a built-in drain pump, allowing you to drain dirty water without any hassles because it can automatically drain dirty water from the machine. On a little drawback, the display is not clear and bright enough than other models do have. But then, it is still one of the best choices when it comes to combo washing machines on the market for its superb features and powerful motor. It can wash and dry clothes efficiently and save you water and time. 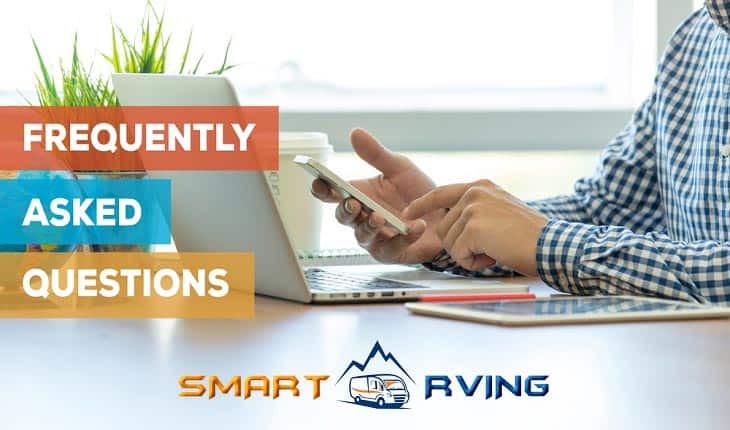 You should trust Smart RVing when looking for the best RV washers and dryers because we carefully considered the factors important when buying these types of appliances. Some of these things include load capacity, drum, operation noise and other factors. In addition, we’ve closely picked only top rated washer and dryer combos on the market so that you can select the best one based on your needs. 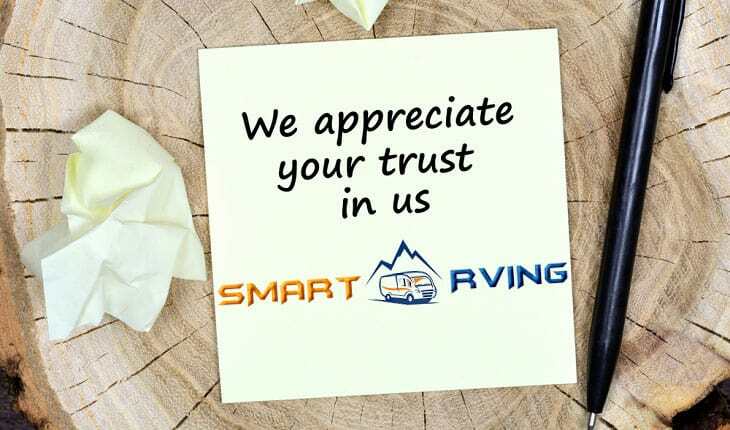 Nevertheless, our reviewers are committed to offering you only the most essential information you need when buying RV appliances, such as the best RV air con and so many more. At the end of the day, we do hope you could select the right washer and dryer combo for your recreational vehicle based on the buying guide, reviews and FAQs that we’ve discussed today. Just as what you can read in RV washer dryer combo reviews, RV washers and dryers are special appliances specifically designed and built for mobile environments. They have a solid and compact design that can deal with constant vibrations and shocks in the recreational vehicle. They are also smaller in size versus traditional washing machines, so they can fit tight spaces. Most of these combo appliances are also energy-efficient and water-saving, making them ideal for camping and RVing. RV washers and dryers, such as a Splendide 2100xc washer dryer combo, work basically the same as our home washing machines. Many of them have a twin tub design, which allows for using the wash and dry functions simultaneously. You just have to put the dirty laundry into the washing tub, add water and detergent, and then select the wash cycle time. 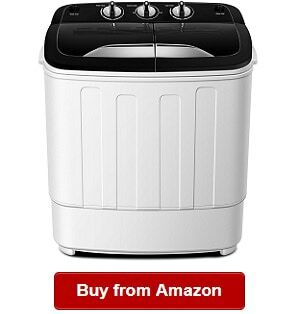 Next, you only have to press the start button to begin washing. When the laundry is done, you can simply transfer the clothes to the spin-dry tub to dry your clothes quickly. In some washing machines, you might have to divide the clothes to dry into two, but nevertheless, you can expect that they will dry fast. At the very least, they don’t require plumbing and most come with a drain hose. You can drain out dirty water into the shower, sink or gray water tank easily and quickly. When it comes to the types of RV washers and dryers, there are not many of them because they basically all come as a twin tub washing machine that features a washtub and a spin-dry tub. This is one of their unique features that allow using the wash option and the drying option at the same time. Most of the washing machines also have varying load capacity, generally between 10 and 15 lbs. So depending on your needs, you might want to choose a combo washer and dryer based on the load capacity you need. So overall, some differences washing machines for the recreational vehicle are the load capacity, rotation per minute and other features. Nevertheless, you should weigh your options based on your washing and drying needs. 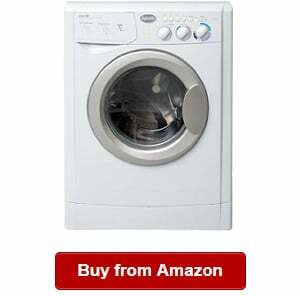 Start selecting from the combo washing machines that we’ve featured in the reviews above. Camping is an enjoyable activity. However, there are many cases when clothes become soiled or stained. 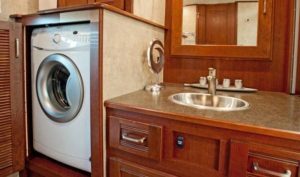 So when aboard an RV, one of the most essential appliances to have is the washer and dryer combo that can make your lives easier and more convenient. To discuss more of the top benefits of having a washing machine for your recreational vehicle, check out the following. Traditional washing machines tend to be bulky and large. 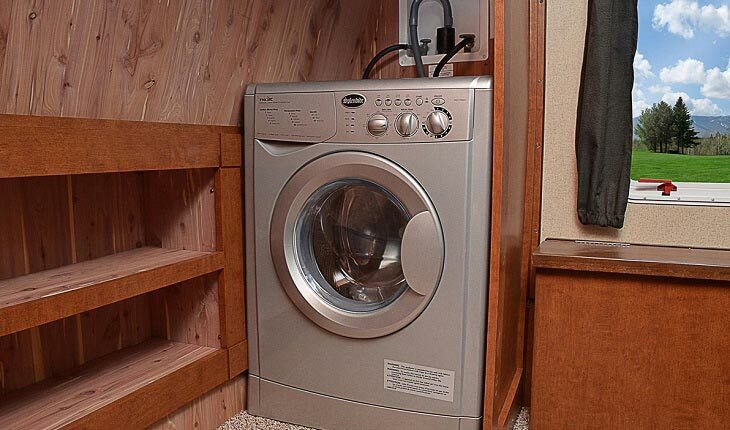 That is why you need a compact and small washing machine that can fit tight RV spaces. With it, you just have to choose where to position it in your recreational vehicle, and never notice it is there because it is compact and small in footprint. This appliance also works well for small homes, including apartments and dormitories. It is also ideal for campers, mobile homes and yachts. Unlike traditional washing machines, RV washer and dryer combos are designed for mobile environments because they can resist vibrations and shocks. They have durable components that can deal with constant movements of the vehicle. These washing machines have a rugged design, which can extend the life of your combo washer and dryer. The best combo washing machines also promote a quiet operation because many of them have a stability regulator. Some of them also have components that can muffle the noise. A quiet operation is what we need for a washing machine for our vehicle. So if you want to experience not only the convenience but a silent operation of the washing machine, choose a especially designed and built combo washer and dryer for the recreational vehicle. When it comes to choosing a washing machine for your recreational vehicle, you should also look for one that has user-friendly settings and controls, adding to the ease of operation and convenience of use. These adjustable settings, such as timer control will let us choose the number of minutes for the wash cycle or dry cycle. The combo washer and dryer products we’ve featured today are compact and can be moved from one place to another without any hassles because they are portable and lightweight. They can be used in camping, homes and recreational vehicles. Before shopping around or adding a combo washing machine to your cart, you should know what to look for so that you can be guided on what to expect. In the following, we’ve highlighted some of the top features or characteristics to find when comparing your options for a new washer and dryer. One of the most important things to remember when buying a washer and dryer combo is its capacity because that will indicate how much you can load to the washing machine. If you’re planning to load smaller amounts of laundry, you don’t have to choose one with a large capacity because that might also mean a large washing machine. You must check the load capacity because it will also help you pick one that suits your needs. In general, a load capacity of between 10 and 15 pounds can be enough to handle most RV washing and spin drying needs. Aside from the above features, you should look for one that has good controls and settings, adding to the convenience of using the appliance. You should check if the controls and settings are what you’re looking for. In addition, you should check that the combo washer has user-friendly controls and settings. On the other hand, you might want to go for an automated combo washer and dryer combo that add to convenience of use. Recreational vehicles have limited space. 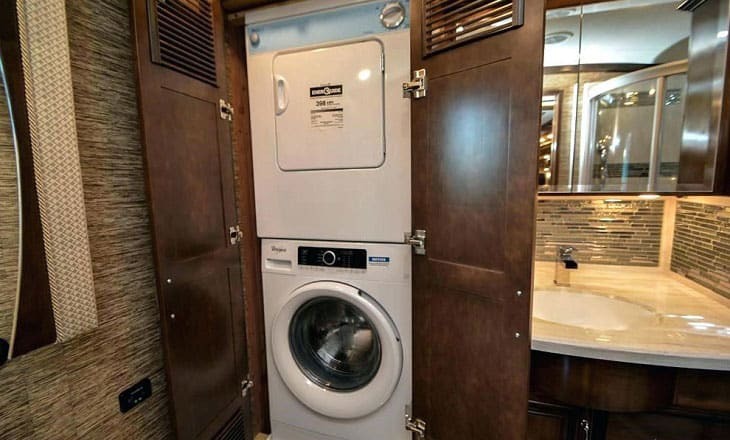 For this reason, you should consider the size of your vehicle when choosing an RV washer and dryer combo. 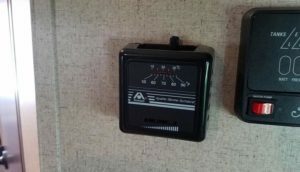 Second, you must think carefully on where to position the combo machine in your RV, and determine which of the available products would fit it. The good news is that there are available sizes for a washer and dryer, so definitely, there will be a proper size that will suit your needs. One of the most important things to look for when choosing a new RV washing machine is its energy efficiency. The reason is that being energy efficient also means that you will save money by not wasting water and energy. Also for this reason, you must look for one that has a great energy star rating. 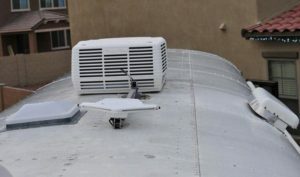 In addition, you might want to find a model designed with a horizontal axis wash system that does not require too much water and energy to operate. It is another factor to consider carefully when buying an RV washer. As you might already know, it is annoying to use a machine that tends to produce too much noise whenever it is running. Especially when washing at night, it will be bothersome to use a machine that can produce too loud sound when it is running. So in all cases, you should find a machine that can operate with minimal noise. Some of the best washing machines now are making use of a direct drive or a tri-phase motor that has the ability of minimizing noise levels. In addition, you might want to find a combo that can reduce noise so that you can use the washing machine even at night. When it comes to the drying system, you should always compare from your options and select the one that will work best for you requirements. This component is also another important feature of a washer and dryer combo that you must be able to find when comparing your options. You might want to find one that is made of durable components. Common drum materials to find include stainless steel material, porcelain or plastic, which are known for offering convenience when washing clothes. On the other hand, many RV owners are choosing one that is made with a stainless steel drum, which can deal with both cold and hot washing. Q: What are good RV washer dryer brands? A: Many brands are to find now, and some of them include Splendide, Westland, Best Choice Products, ThinkGizmos, Giantex, SUPER DEAL, KUPPET, DELLA and Dometic. These are some of the brands that we’ve reviewed and believed to be some of the finest choices if you’re looking for performance, durability and reliability. Q: How to install an RV washer dryer? A: In many of the washer and dryer combos we’ve featured here, they do not require installation. 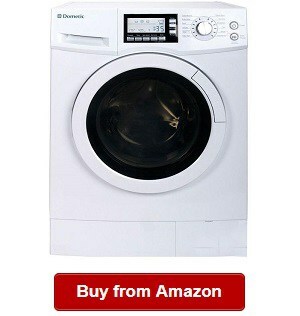 It is because using this appliance is the same as using traditional washing machines we use at home. The only difference is that these RV washing machines are portable and smaller in size. But nevertheless, you just have to find the perfect spot where to position your RV washing machine. 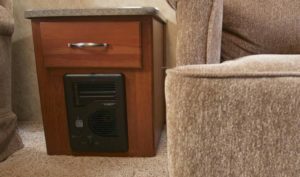 Q: How to winterize an RV washer dryer combo? A: The potential for freezing temperature affecting the washer and dryer is a challenge for many RV owners especially if they’re trying to store their RV washing machine. If you would like to protect the machine from damage due to freezing temperatures, you should learn how to winterize the washer and dryer. Depending on the maker of the combo machine, you might want to check specific instructions on how to winterize it. A: Using the RV washer dryer combo is as simple as using a typical washing machine at home. You just have to put the clothes, add detergent, add water and then set the timer. Next, you can press the start button to begin the wash cycle. When done washing, you can transfer the clothes to the dryer to dry your clothes. There you have our guide on how to choose the best RV washer dryer combo as well as answers to some of the most frequently asked questions regarding its use. We do hope you can weigh and compare your options well so that you can find and use the right combo washer and dryer that suit your needs today!